School's (almost) out for the summer! Posts have been light this week because we are in full End of School mode! A had a teddy bear picnic at the park with his class today and tomorrow is a field day his last official day of school! I'm equal parts excited and nervous about having both boys home all day, everyday! Of course we'll do the summer classes, sports camps and swimming, etc. 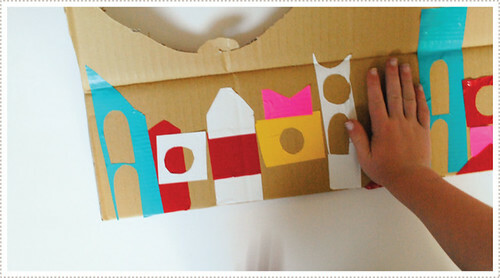 but I'm sure we'll still have to come up with A LOT of fun crafts to keep these little guys entertained. And like always, we'll be sure to share them all with you! Little O and I have also been enjoying our last few days together one on one with ice cream dates here and park excursions there. He'll be headed off to preschool next year (again, equal parts relieved and sad my little guy is growing up). We also have our first official family reunion this weekend. And so it begins. WooHoo for summer! 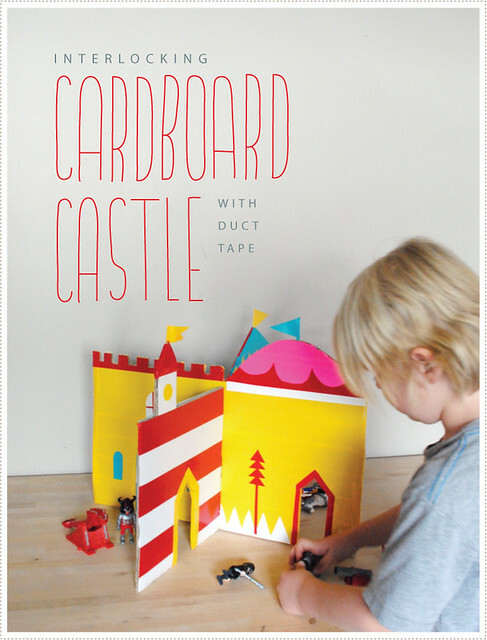 OK friends, I've finally got everything together to share with you our latest cardboard + duct tape creative adventure (which is the perfect weekend project for you and your Littles). 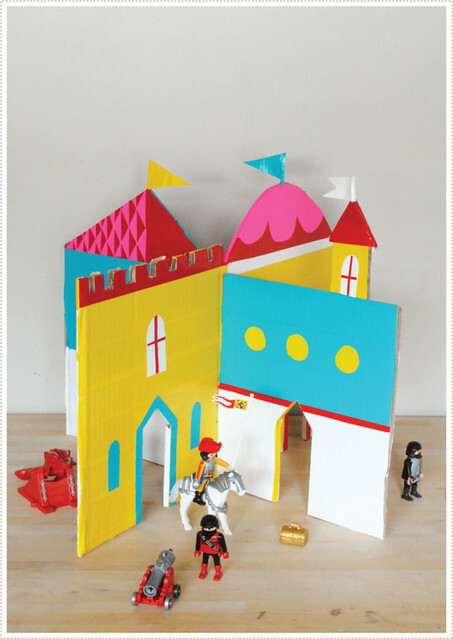 Presenting...our Interlocking Cardboard Play Castle! We are having SO much fun with this, you wouldn't even believe it. 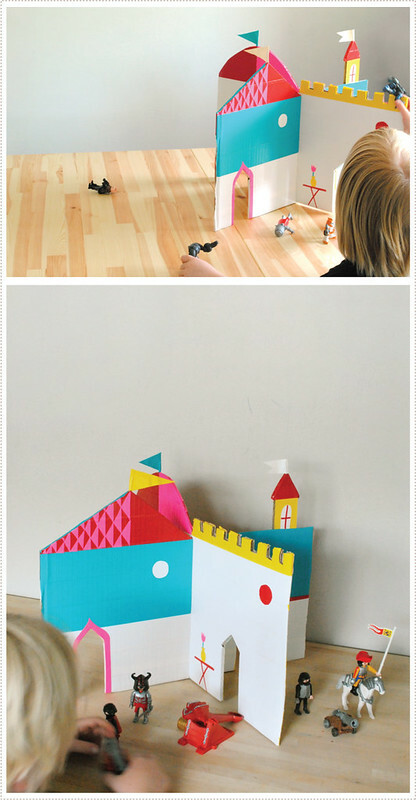 In fact I think I've found just thing to get me more engaged and on the floor playing with my Littles in their world. I'm not usually one to sit down and "play" with my kids. I typically help to facilitate their play and then let them go at it. But with this castle...well I've been down on my hands and knees playing castle right alongside them (and I forgot how fun delving into accents can be..). Well I have to confess, I got a little obsessed with this one. It was SO much fun to make. Once I finally figured out how to cut and handle duct tape, well I couldn't wait to try my hand at something a little more involved. 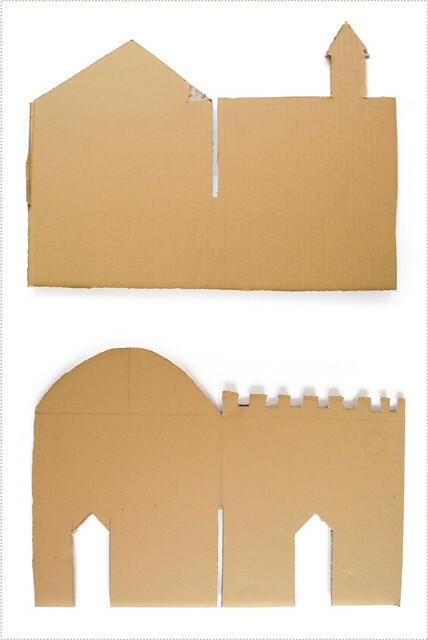 To begin, I used sturdy cardboard (taken from an old Baby Lock sewing machine box) to cut out the basic interlocking shapes of my castle. I decided to go with a 10"x10" squares for each portion of each wall (so a 20" long sheet of board all together) and then added a mix of castle-like rooftop structures up top. I then cut out door frames from each wall, making sure they were large enough for the Littles play things (namely Playmobil characters) to fit in and out of. 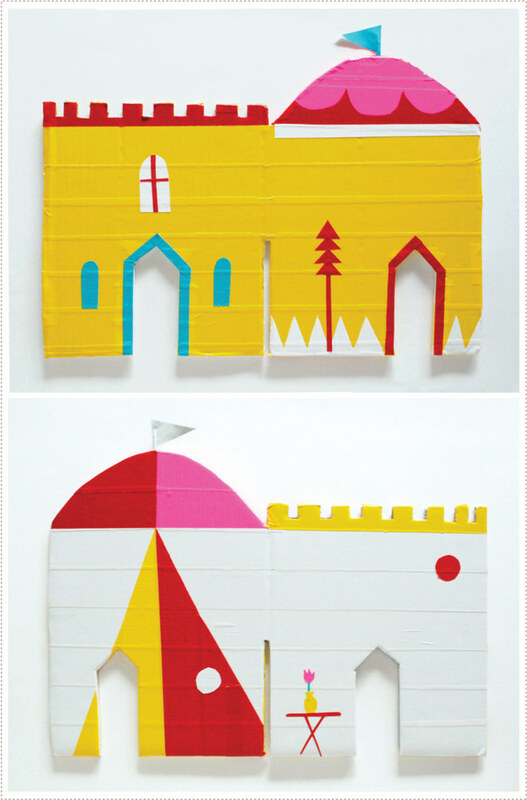 And now comes the fun part...decorating the castle walls with brightly colored duct tape! (I should get them to sponsor these posts, don't you think? I mean I'm only singing their praises like, every other minute...:)) The only hard part in decorating the castle was deciding on what to leave out, as there are so many directions you could take this. In the end I decided to keep it fun and graphic and not too specific as to what you would do in what room (but you could always go more literal by having more obvious interior and exterior rooms, etc. for yours if you like). I did add a few small elements to some "rooms" such as a tree to suggest the outdoors and small table with a tulip for an indoor room (hey, even strong warriors need a calm place of respite after a long journey or a fierce battle, right?). I also added flags to some of the rooftops by simply wrapping duct tape around a tooth pick and then cutting it down to the desired shape. From there I just pushed the tooth pick into the top of the cardboard (I might however decide to hot glue them in later for greater permanence). If you want to have your Littles help with this process, adding the details/decals is a great way to do it. Just be sure that you are doing the cutting and then you can hand the decal over to them and have them place it on (and depending on their age you might want to help them with this. A would get really frustrated whenever an item folded over onto itself and he couldn't take it apart). You can also bring them in on the design process. They'll love letting you know just what they have in mind for their castle. 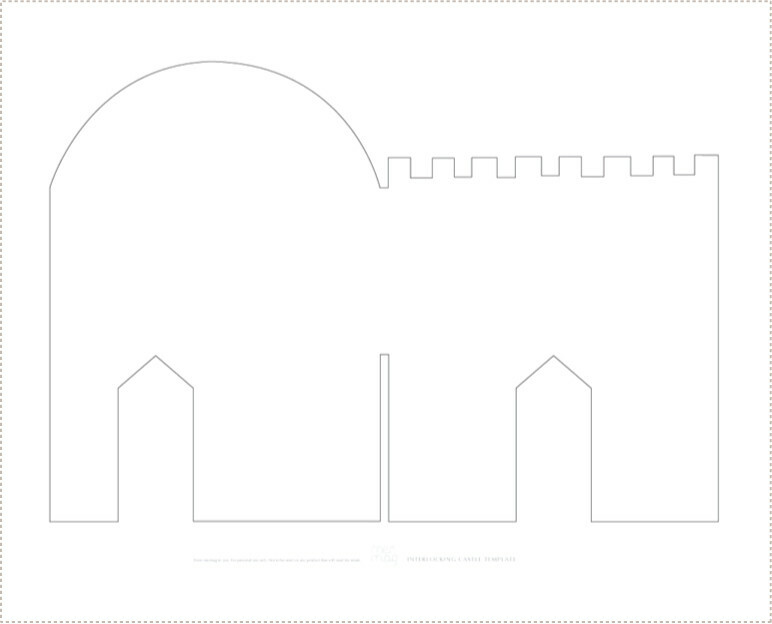 And if you are interested in creating an interlocking castle yourself, and want to follow the basic shape of mine, I have created some templates for you to use. 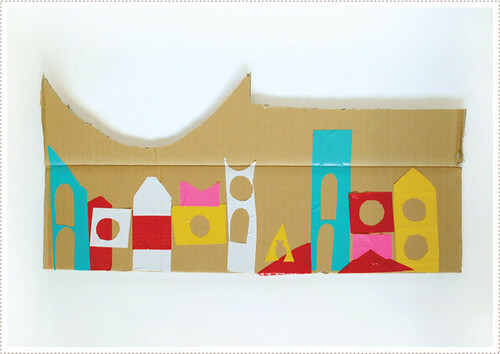 Just print them out and use them as patterns to trace onto your thick cardboard (or foam core works really well too). 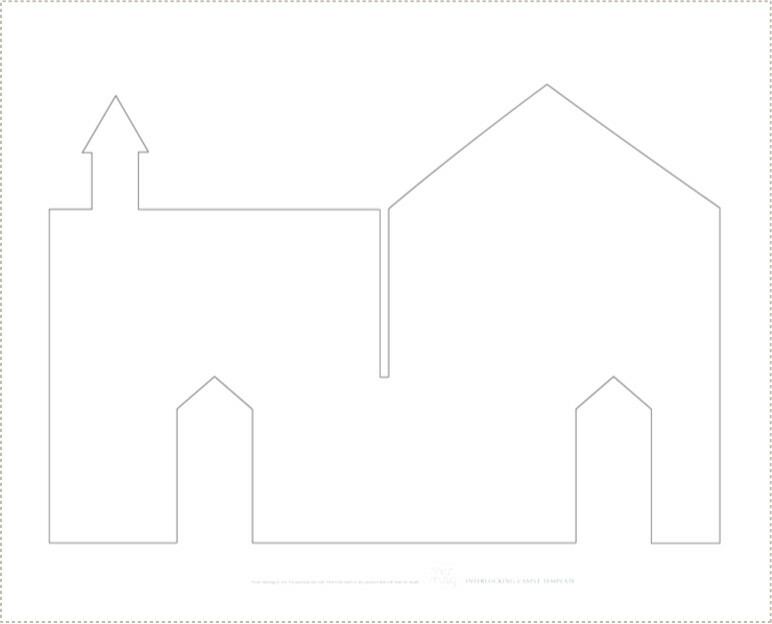 These templates are created as an 18"x24" document so that you can print them in their entirety. I would suggest saving the files out to a thumb drive and then taking them to your local copy store and have them print them on large sheets of paper there. 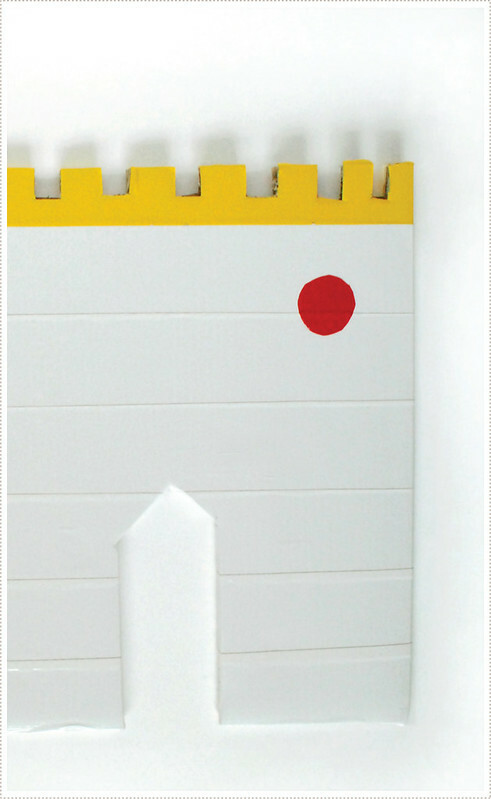 Click on the pictures above to download each section of the castle. 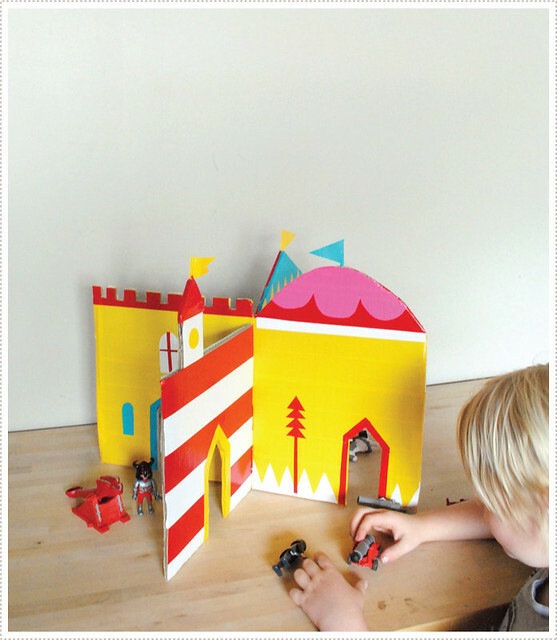 Now that you are done decorating your castle, it's time to assemble it by lining up the center notches and pushing the top one down (be careful not to un-stick all of your duct tape "siding" in this process. I might suggest scoring the duct tape a bit where the two boards interlock so that this doesn't happen). 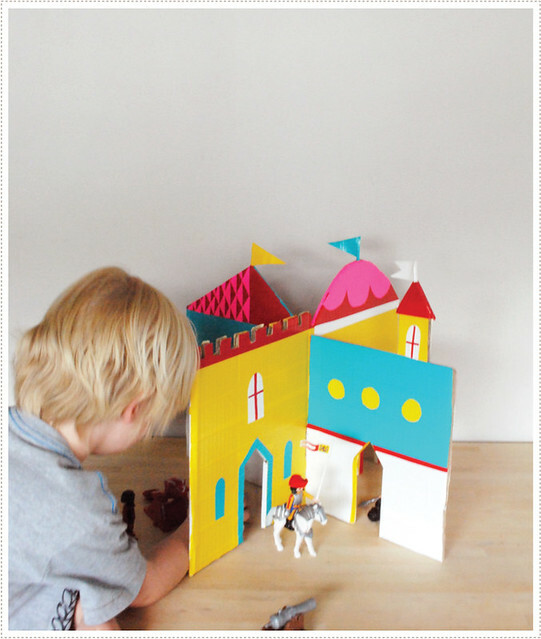 Now it's time to gather together your little ones toys and figurines and let the play begin! Oh and you can invite the Littles to join you if you so wish. And what fun you will all have exploring all your many rooms! (which can actually change by the way, depending on how you assemble the boards together at different times). I also love just how portable and rather study this little castle is (that's the great thing about duct tape, it's sort of indestructible). Just bring it over to the kitchen table while your making dinner and your Littles will be entertained for a good long while. 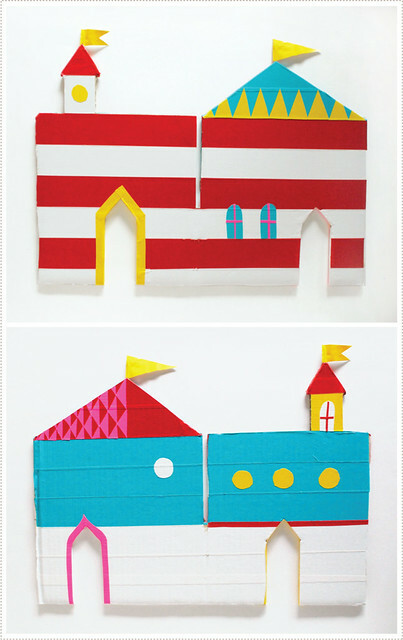 And if you make one of these, I really really would LOVE to see what you do with it. I'm just so excited about the many possibilities for this little castle and I have a feeling that your touch is just what it needs to take it to the next level of magic. So don't forget to email me and share! Happy Weekend Friends! I'm off tomorrow to hear A perform his songs he's been practicing for Kindergarten graduation. I'm pretty sure it's bound to be just about the most adorable thing ever. And then next week we have a field day, a Teddy Bear picnic and more. Oh how I love the last few days of school and the beginning of summer! OK, so I'm sure you've noticed that I've been on duct tape kick as of late. 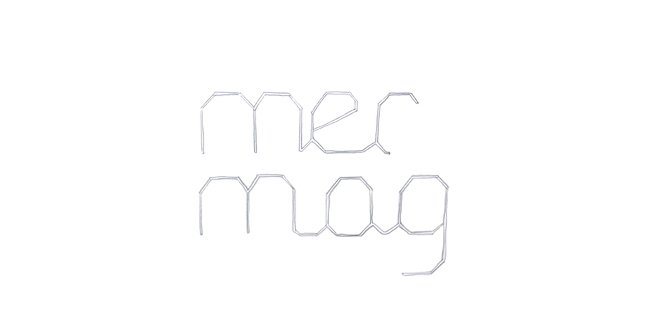 And if you are just catching up now, you can see a few of my past projects here and here. If you are looking to delve into some duct tape endeavors of your own, I thought I'd share a few helpful hints on how to handle duct tape - specifically how to cut it without wanting to pull your hair out (I had to learn this the hard way). First off, do NOT use scissors. I made this mistake when I initially approached my first project. Basically you'll end up going nuts and vow to never do anything with duct tape again. Duct tape is super sticky so when you try to slice it with scissors things just start sticking to each other and once the sticky part of the tape sticks to itself, it's nearly impossible to get it apart. It's also hard to get precision when cutting and your scissors end up all gooey and well, it's just not fun. So let's talk about how to do it right, shall we? You will need a utility knife, a self healing cutting mat and of course some duct tape. 1. Start by rolling out and sticking your duct tape to the self healing mat. 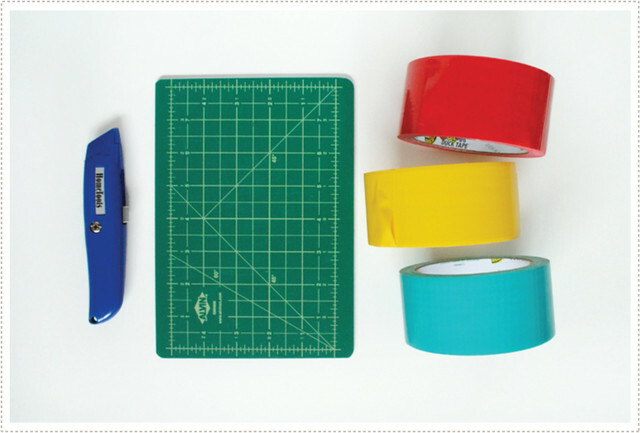 Cut a portion of tape off of roll (you can get a really nice straight line this way (and if you want to use a straight edge or ruler, that works even better). 2. 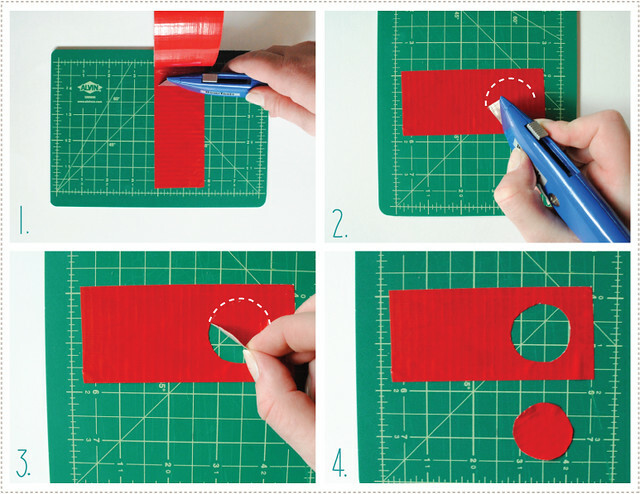 Cut desired shape out of tape by pressing utility knife firmly into the tape so that it cuts all the way through. 3. Peel away newly cut shape. I've also found that if if you use the tip your knife to get right under the shape to begin lifting, you avoid the slight turn over your fingernail could create. And what's even more fun is that A got an impromptu craft project out of my left over cardboard and duct tape cutting scraps. Don't they just make the most perfect skyline? I seriously love how it turned out (and I love that I didn't have to plan a thing for it!). Our family spent the weekend working, working, working! We've been rearranging our little home to better suit our current and future needs as a family and the boys were right there with us the entire time (OK, we did have to send them out to the back yard a couple of times and did put in a show for them from time to time when things got super hectic, but for the most part, they were right there in on the action with us). 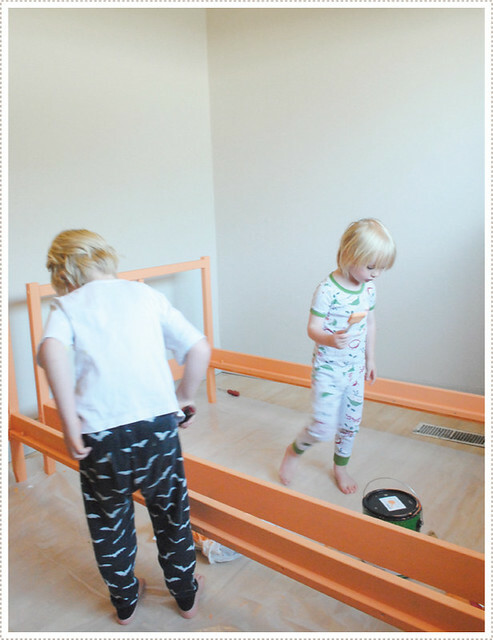 We started the day with painting the boys beds, and let me tell you, the boys were really into it. I love the excitement and fervor little ones have when the are included in on "adult" work. 1. Stay on the plastic. 2. 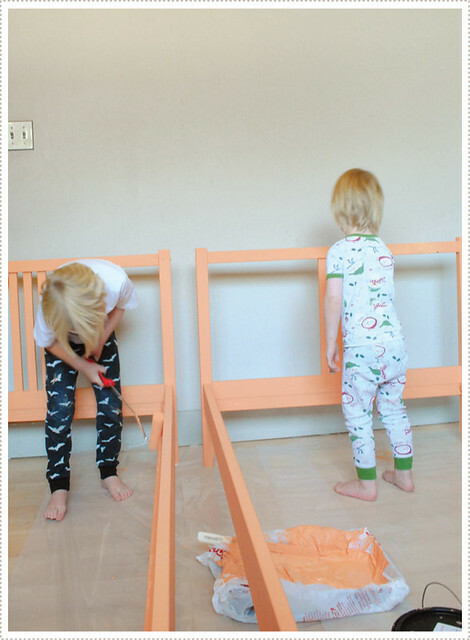 Only dip your brush/roller into the paint after applying several coats to the beds. 3. When dipping into paint only get a little bit of paint, letting excess paint drip off before applying brush/roller to bed. 1. 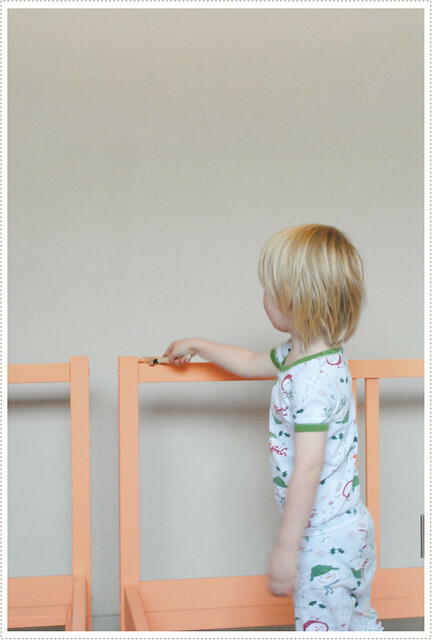 Don't overreact when they make mistakes (which is pretty much a guarantee with Littles), such as when they get globs of paint in spots on the bed. Simply point out what is going on and help them to smooth it out. 2. If you need to go back over things, be careful to let them know that they did a great job, and that your painter job is the "follow upper", or something with an even sillier name. 4. Put on some fun motivating music to keep all of your spirits up (we tuned it to Pandora's Vampire Weekend station and rocked out). 5. Try to run with their enthusiasm and not to squelch it when they want to do something above and beyond what you had in mind for them. Realize that pushing your limits (as well as theirs) is just as much a part of this process. 6. But even still, remember that it's OK to have boundaries, like when they want to paint the underside of the bed. Say, "Oh I'm so happy you LOVE painting so much, but we don't really need to do that and we are done, so let's put the paint and brushes away now". 7. Teach them how to clean up (and the importance of it), even though you really just want to do it yourself as it will be much faster and a whole lot less of a mess. 8. Sigh in relief when it's all through, and then pat yourself on the back for aiding in creating self-actualized human beings and relish in the family work time spent together. (notice how I had many more guidelines than they did throughout this process?! Remember, teaching kids to work, and to love it, is actually more work for you in the short term, but a huge pay off for both you and them in the long run). I can recall a number of fond memories working with my family as child. One such memory involved my dad and my older sister and I deep cleaning our entire kitchen one Saturday morning so that we could then go to a water park later on that afternoon. I'm sure I initially wasn't into it but as we all chipped in together and cranked up the Beach Boys we all had a really really fun time. (I still think of this memory when hearing certain Beach Boys songs to this day! I think my sister also introduced me to Tori Amos that morning and I've loved her ever since.) I can remember feeling closer to my dad and sister in this moment than in our typical day to day interactions. Isn't it crazy how work can do this?! I also remember that the first water park we wanted to go to was closed down so our dad drove us all the way to Loveland, Co (another town just outside of where we lived) to catch the very last few moments of that water park before it closed. I can't say as I remember much of that water park experience, but I do remember the fun I had cleaning the kitchen with my dad and sister very well! 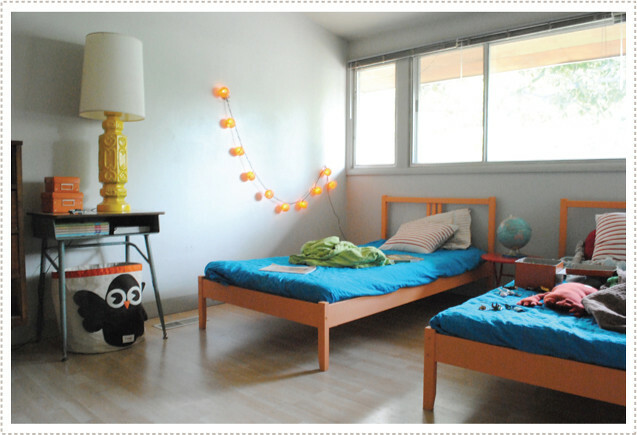 OK, so In addition to painting beds, we moved the boys into our larger room and put our things into a much smaller room (which I actually LOVE a whole lot more as it has a much more cozy, clean and simple vibe to it now). I got a quick snapshot of the boys new "in progress" room just as the light was beginning to fade (which explains the dark, graininess of the photo). We love it so far (although I really want to change the boys quilts out for a simple grey and white patterned comforter, such as these from West Elm. Don't you just love peach and grey together?! Although Jon fears it will veer too feminine. What do you think?). Well I was sure to point out to the boys what a difference all of their hard work made, and they are definitely over the moon about their new beds. We have sort of a manta in our house that goes something like "sometimes things are hard, but we do them anyway". We are then sure to point out the pay offs, and stuff like, "it will get easier the more you do it", etc. I'm big on not letting my kids miss out on experiences in life just because they were too afraid or because it was "too hard" (or let's be honest, because it was too hard for me to deal with at the time). Jon jokes that I sort of lean towards a "China Mom" parenting philosophy in this respect. I'm definitely not all China Mom but I strongly agree with the last statement from this article: "the Chinese believe that the best way to protect their children is by preparing them for the future, letting them see what they're capable of, and arming them with skills, work habits and inner confidence that no one can ever take away."